One of the most successful Amtrak Routes in the country is the Amtrak Cascades with over 600,000 riders per year. Recently the route got wifi, which means those 600k+ riders can ride the Internetz at the same time they’re riding the rails! 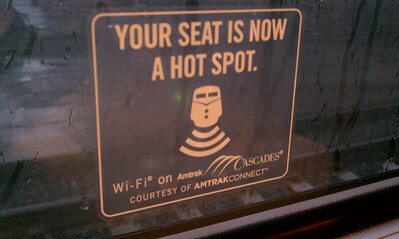 I decided to test out the wifi with some uploads and such, so everything in this blog entry is uploaded and published via the Amtrak Cascades Wifi. If you’re interested in the Agile Open Northwest Conference I’ll have some coverage on my Composite Code Blog. The total ridership for all Amtrak Cascades trains in 2010 was actually 838,251. The 600,000 you referenced is for the three out of the five trains that are supported by Washington state.